This week has flown by. At first it seemed like one of those weeks that was totally dragging, then yesterday it felt like Friday (disappointingly it wasn’t), and now it’s Thursday and I’m wondering where the week went! Every day this week I intended to blog, but something always got in the way and I’m already getting that “I have so much to update on” feeling that makes me not want to blog. Anyhow, I have some progress to show you on two projects, a new one I started, and the most awesome thing ever that arrived in the mail yesterday. 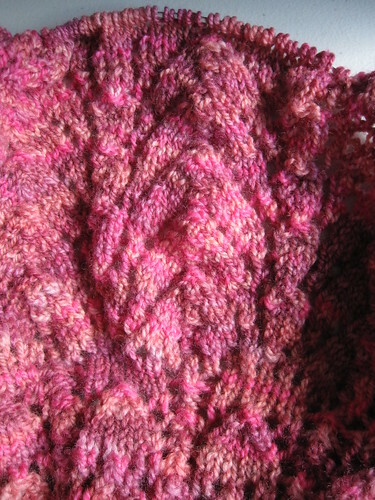 This past weekend I spent as much time as I could working on the Secret Garden Shawl. It paid off because I’m now done with clue 4 and two rows into clue 5. 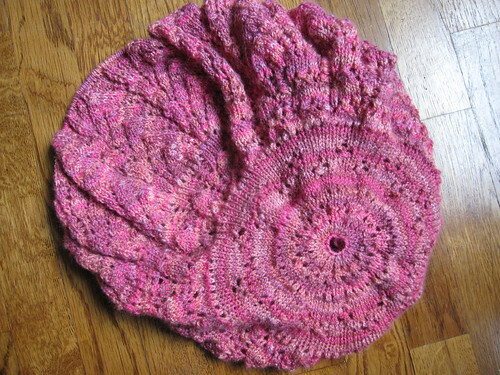 I’m using a 29″ circular for this and now that I’ve increased to 760-some stitches, they’re kind of crowded on there. I don’t have a bigger circular, nor do I want to get one. It’s working well enough, it ‘s just a lot of work to move the stitches around because there’s so many now. Close up of just the portion that is clue 4. The shawl has been put aside for now, though. 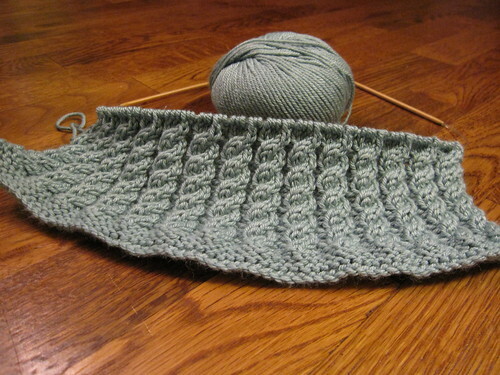 After I did a few rows of clue 5, I set it aside to work on Starlight. This past weekend I got to the point where I was a few rows away from binding off the left front, but I set it aside (can’t remember why). 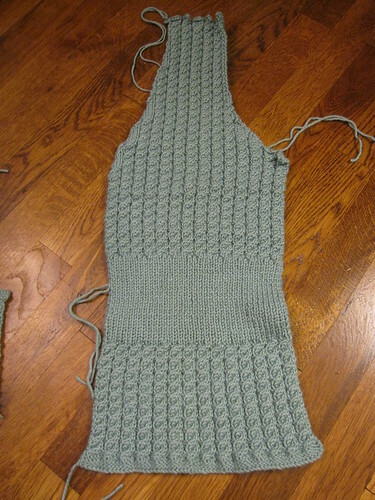 Tuesday I picked it up again and finished the last few rows and now the left front is done. After that was finished, I cast on for the right front. Figured I’d better get it going right away so I don’t lose momentum! 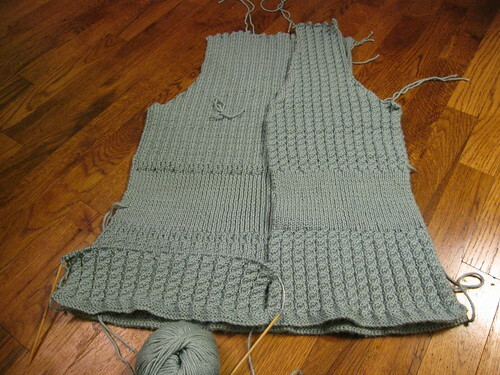 As of last night, I only have a few more cables to do before starting on the 1×1 ribbing. Being able to see so much progress has helped to keep me motivated. If I keep working at the pace I have been these last few days, I think this will be done before September is over! 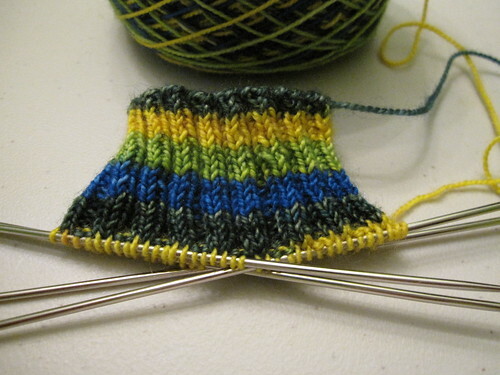 The new project I started this weekend is a pair of iPhone Mitts with last month’s Vesper sock club shipment “Summer Breeze (Makes Me Feel Fine).” Pretty simple pattern and thanks to the bright, fun, stripey colors of the yarn, I don’t really mind all that 2×2 ribbing. 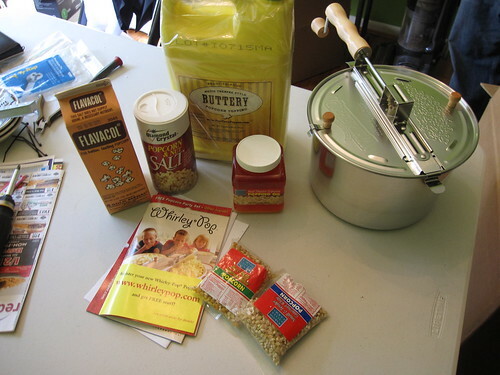 Well, I think it’s awesome and if you love popcorn, you will, too! I’ve been having the worst craving ever for popcorn for a long time now. Matt has forbidden microwave popcorn in the house and I can’t really say I blame him. It’s okay, but definitely not my favorite thing. Movie theater popcorn, though, is on my list of “Best Foods Ever” and when he told me about how Dognose on Shack News is always talking about how awesome popcorn is from a Whirley Pop and that it’s the only kind of popcorn he would agree to eating, I had to get one. Dognose was kind enough to put up a Popcorn FAQ. I ordered everything he listed and in 2 days (yesterday) it was on my doorstep. 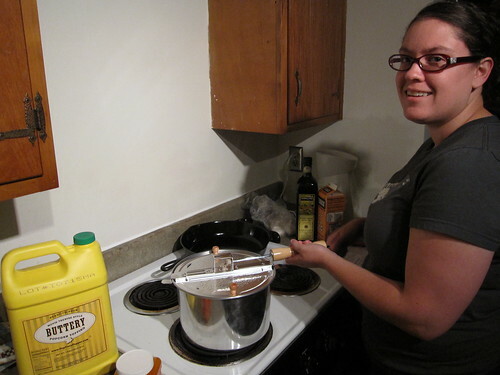 Flavacol Brand theater popcorn salt, popping oil, and the Whirley Pop. After dinner settled, I had to try it out. I followed the instructions in the booklet and started by seasoning the pan. 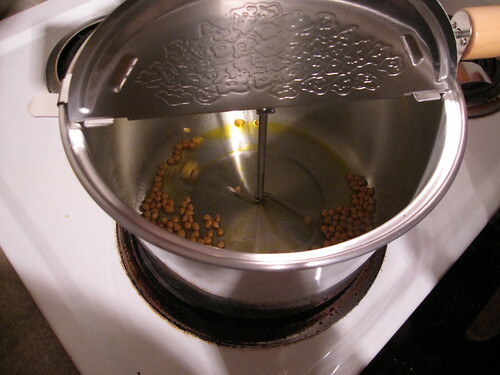 After it cooled and the burner on our electric stove was heated, I put in the oil and popcorn and got to work. 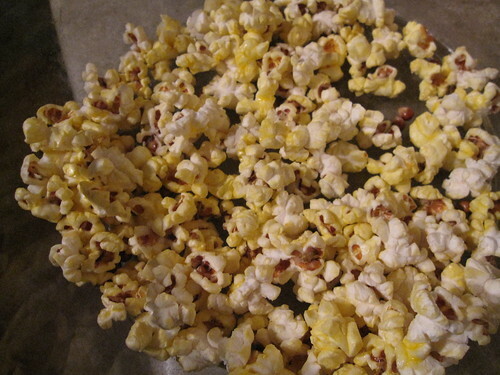 Popcorn is done and all the delicious toppings are on it. And our thoughts on it? 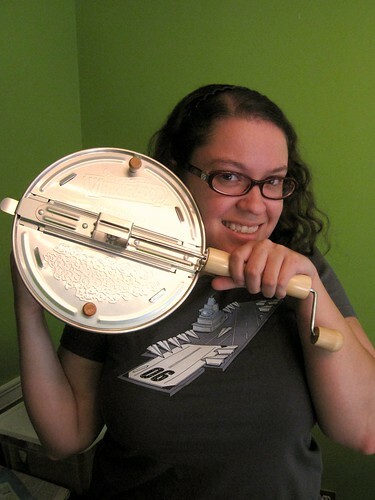 PS You can see more pictures of the Whirly Pop over in the Flickr set. First, your knitting is phenomenal. 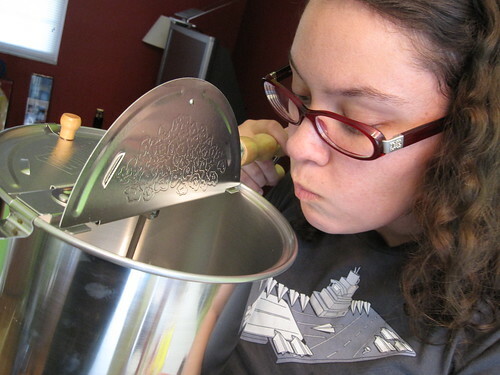 Now–the popcorn popper. I had one of those (lost in a move), and it was WONDERFUL. Just the best popcorn evah. OHMYGAWD!!! It is taking all my willpower not to go and order all of that right now!!!! I LOVE movie theater popcorn!!!! How much fun that must have been!! I’m cracking up! 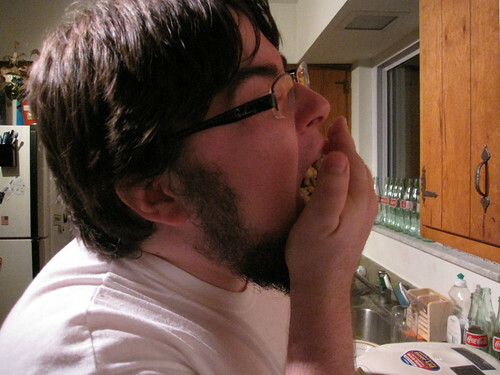 Nom Nom Nom that good popcorn!!! Starlight is looking awesome. Love those cables, and you are totally jamming on it! Both of your projects are beautiful. I’m impressed with allllll those cables on the sweater!